The practice of wearing Tilaks dates back to the Rigvedic period. Vedic people used to smear several parts of the body with ashes, ghee, etc. after the conclusion of homa or yagna, which used to be the principal religious ceremony. With the passage of time, the practice of marking tilaks got further segmented with the growth of Shaivite and Vaishnavite cults, and evolved a varied style of texture which marks their own identical entity. The process of marking several parts of the body with tilaks became a customary gesture and symbolic spiritual aspiration too. Amongst the followers of the Hindu Trinity, Shaivites stand prominent and they mark their body with bhasma and Tripundra tilaks. 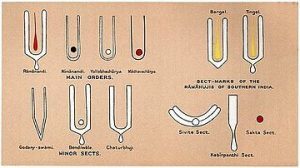 Bhasma means besmearing the body with ashes and Tripundra tilak is a drawing mainly of three horizontal lines with a bindi or dot in varied sizes, either superimposed or drawn above or below between the two eyebrows. They are made with ashes and sandal paste of varied color temperatures, each associated with particular sect. At this juncture let us mention the Bhasma Dharana or the practice of besmearing. The Bhasmajabolopanishad elaborates all its aspects. Noted Indologist and great Sanskrit scholar Dr. T.R. Sharma noted that Bhasmajabolopanishad in its prologue states that “I am the Brahman alone, which remains after the illusion of the existence of anything except that the self has been reduced to ashes by the fire that burns at the time of dawning of right knowledge. We find in ancient scriptures that Sadhus or ascetics used to besmear their bodies with the ashes of the cremation-ground, which itself is a symbolic act giving a definite direction to its hidden meanings. In this regard, Amamkosham (Dictionary) explains that God is identified with Maha Vibhooti. And whosoever sports vibhooti or Bhasma inculcates the spiritual semblance of God. Coming back to the ash one can easily understand that after the death of mortal body, the body would get either the shape of ash or mud. The ingredients of vibhooti are mud and ash which reminds a devout that his body and worldly desires are temporary and before long it will take the shape of ash and mud after death. The ingredients of Bhasma-Dharana and its symbolic spiritual aspiration are explained mainly in two Upanishads, namely, Brmhajjaboupanishad and Bhasmajabolopanishad. The ash or Bhasma is prepared out of burnt cow dung. It is said that in cow’s body the Lakshmi goddess resides and so the cow dung is used for the tilak-paste. Thus this ash removes the foul odor of human body and purifies the body of a devout. According to the Upanishad there are five types of Bhasma derived from particular breeds of cows and having its own significance. These are Vibhuti, Bhadra, Bhosma, Ksara and Raksa. Vibhuti was derived out of dung of Nanda cow of tawny color, which comes from the place called Numtti. Whosoever wears this tilak gets immense power and prosperity. Similarly, Bhadra types are derived from Bhasita cows which are dark in color and come from Pratishia. This type of Bhasma destroys all kinds of sins. The third type of ash is derived from the cow dung of Surabhi cow which is known as Bhasma. These Surabhi cows are red in color and found in Vidya. The devout who wears this type of tilak shines brightly in life. The white color Susila cow provides Ksara cow dung which comes into existence from Shanti. It removes the troubles of devout’s life. Raksa (Raksha) Bhivooti comes from Sumara cows of Santyatita and these cows are of variegated colour. Ancient scriptures state that Raksa ash provides protection from evil spirits and demons. Apart from Bhasmaa devout Shaivite must sport Tripundra Tilak. According to the sacred text of Vrihadbrahmottara- khananda, “Beginning between the eyebrows, and carrying it to their extremity, the mark made with the thumb reverted between the middle and third fingers is called Tripuridra.” There are twelve places in the body where Tripundra Tilaks are applied. Tripundra personifies as Pranava (life) and indicates the three activities of God, i.e., Creation, Sustenance and Destruction. In other words it represents Trinity of Hindu Gods- Brahma, Vishnu, Maheshwara (Shiva): Thus Tripundra signifies the supreme God himself. In the text of Kalagnirudrupanishad another dimensional interpretation of Tripundra is found. Tripundra represents three gunas or intentions of man, that is, “Rajas, Sattva and Tamas”. Moreover, these three lines signify Kriya Sakti (power of work), Iccha Sakti (will power), and Jnana Sakti (power of knowledge). The text further states that these three lines represent three moods of Shiva like ‘Maheshwara ‘, ‘Sada Shiva’, ‘Mahadeva’, which are the symbolic representation of Tripundra. Tripundra Dharana (or application) and its ritualistic mantras have been eloquently elaborated in the Brohojjabolupanishad. 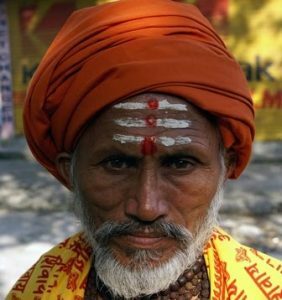 It says that Tripundra mark should be worn on the forehead with the mantra Bhrahmane Namaha; on chest by pronouncing Havyavahina Namaha; on the navel by uttering Skandasa Namaha; on the neck with the mantra Vishnava Namaha. While applying tilak on the back the mantra is Hareya Namaha; on the hump Shavabe Namaha; and on the head Parmatmine Namaha. The mantra Prityabhya Namaha goes with the tilak below the elbow, and Eshan ambhyan Namaha for above the elbow, and for the sides one should recite Eshandbharya Namaha. It may be noted that Tripundra should be marked with index, ring and middle fingers only. In an elaborate research on the subject Dr. T.R. 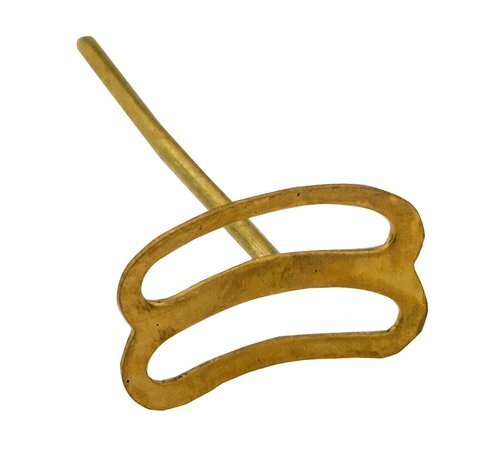 Sharma had explained as to why Tripundra marks are to be worn on different parts of the body. Dr. Sharma wrote: “The Upanishad says that by applying the Tripundra Tilaks over the head, one causes all the sins accumulated through various previous births to perish. Sins committed by parts of the body above the throat will perish by wearing the Tripundra mark (over the neck). Thus Bhasma and Tripundra save the devouts from various sins committed by different parts of the body. Today there are about 34 types of Shaivite tilaks available and are worn by different sects of Shaivite cult. Fundamentally speaking, there are two main groups among the worshipers of Shiva: one is Lingaites and the other is Shaivites. Lingaites are basically staunch believer of Shiva and they do not believe in Vishnu and Lakshmi and sport a locket of lingam and generally never put on Rudraksha mala. On the other hand, Shaivites are believer of Vishnu and Shiva both. 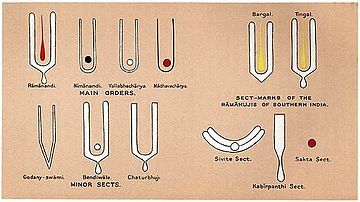 With the passage of time many sects have come up and they sport varied types of Tripundra. Some of them are Bhahacharman, Vadainal, Vathiae, Asthasahastarn, Kanigal; etc. Apart from these some Brahmins of South India like Aiyanger, Aiyar, Rao, etc. wear a Tripundra Tilak. 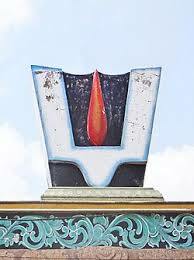 Tripundra Tilak has lived down the ages as a symbol of Shiva himself. But today wearing of this Tripundra Tilak has only remained as a custom for most of the devouts as much of the meaning is lost to them. Nevertheless, this Tripundra tilak and besmearing the body with Vibhooti is part of the socio-religious ethos of a Shaivite devout.